Scrapped - The intended plans for the Crescent Gardens development in Harrogate. After all the delays, the dreams, the broken promises and the controversy, Harrogate Borough Council now finds itself back to square one over Crescent Gardens. The potentially grandest building development in Harrogate since the convention centre in the early 1980s came to an end before a single brick was even laid when ATP (Crescent Gardens) Ltd led by flamboyant Harrogate developer Adam Thorpe failed to submit a planning application in time. Mr Thorpe says that, in his view, the contract remains valid - despite the council having served notice on Monday, exercising its right to walk away from the sale at the civic heart of Harrogate so that the building could be put back on the market without delay. There had been doubts over the development from the very start in 2014 when Harrogate Borough Council first announced its intention to sell its historic Crescent Gardens offices as it prepared to to consolidate its various buildings into a single, purpose built eco-friendly building off Kings Road. The idea of turning the building into a hotel came and went without much happening. Mr Thorpe’s team rode in like glamorous lifesavers on expensive white chargers. But some asked whether private luxury apartments. not to forget an underground wellness centre, too, were the right use of such a prized civic asset? Others expressed doubts whether anyone would pay the millions being touted to live there. Some even suggested the project was too expensive to be realistic for a local developer with little previous track record of achieving such lavish ambitions. The question facing Harrogate Borough Council now is what do with an important building in a prime spot. It is certainly keen to get on with it - and not just in terms of recovering the remaining rent Mr Thorpe owes for basing himself at Crescent Gardens for nearly two years. Deputy leader Coun Graham Swift, cabinet member for economic development, said this week the council was keen to take positive action after the disappointing end to the lengthy saga. Coun Swift said: “I’m disappointed that we’ve had to pull the contract. It needn’t have come to this, but we cannot ignore repeated false promises and missed deadlines. “I know that redeveloping a building like Crescent Gardens is complicated and not straight forward, but we’ve made allowances for that. “We have been very patient since contracts were exchanged. Harrogate Borough Council has always emphasised that, financially, it is not dependent on the sale of Crescent Gardens. A Freedom of Information request submitted by a resident in Harrogate on January 18 showed Mr Thorpe’s company had paid the council £13,576.38 in rent for Crescent Gardens prior to October 1 and another £3,001 since then , a modest sum compared to the millions the building is valued at. A council spokesperson this week said: “ATP (Crescent Gardens) Ltd was renting office space at Crescent Garden earlier in the year but left a number of weeks ago. And the council has also kept the £150,000 non-refundable deposit Mr Thorpe paid when contracts were originally exchanged in 2017. But there are potential ramifications, politically, too . Harrogate council opposition leader Pat Marsh has called for investigation into the collapse of the deal and what, if anything, went wrong. She said: “I didn’t think this project would ever get off the ground. For the wider public, the key question, perhaps, will be what actually happens to the building and the grounds fin such a prominent spot lying in the full glare of the Royal Hall opposite. Some are asking that the council should carry out a true consultation with Harrogate residents over what should be its future. What that should be is a moot point. Suggestions are already coming in from civic groups and like-minded individuals as to what do to with the site. What’s common is the idea that Crescent Gardens in future should remain mainly a community, rather than provate, resource, of benefit to the whole town. Whether that makes any more sense, financially, for Harrogate Borough Council is another matter. 2014: Harrogate Borough Council announces the sale of its historic Crescent Gardens offices as it prepares to consolidate its various buildings into a new civic centre off Kings Road. 2015-16: Ideas of turning the iconic building into a hotel while retaining most of of its features fail to attract a credible buyer. 2016: ATP (Crescent Gardens) Ltd led by Harrogate developer Adam Thorpe emerged as the preferred purchaser after the council marketed the building. March 2017: The council exchanges contracts with ATP (Crescent Gardens) LTD, for the sale of Crescent Gardens with radical and lavish plans to build luxury apartments - subject to a number of pre-planning conditions. Mr Thorpe engages prestigious London-based architectural firm Squire & Partners to lead the design. He says he hopes to apply for planning permission “within the next few weeks” and expects work to start on site in summer 2017 ready for completion in 2020. July 2017: Mr Thorpe admits that the complexity of this luxurious and controversial project had delayed the plans by his firm ATP (Crescent Gardens) Ltd.
December 2017: After moving his team into the building, Mr Thorpe tells the Sunday Times the development would include world class luxury apartments with prices of up to £12 million. October 2018: As part of the pre-planning application conditions, Mr Thorpe applies for the lease from the council to make use of the public spaces. 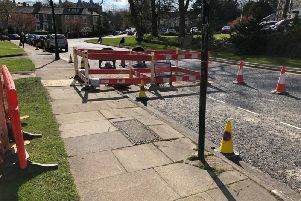 November 2018: Harrogate Borough Council sets a final deadline of April 5, 2019 for ATP to submit a full planning application or lose the contract. February 2019: ATP holds a public exhibition/consultation at Rudding Park Hotel in Harrogate attended by Mr Thorpe who tells the Harrogate Advertiser that most of the bespoke luxury apartments have clients lined up ready to buy. March 2019: Respected local group Harrogate Civic Society condemns ATP’s plans as amounting to the “demolition” of Crescent Gardens. April 8, 2019: Harrogate Borough Council announces it has ended the legal agreement after ATP (Crescent Gardens) Ltd failed to submit a planning application. The question remains what the council will now do with the empty building. The Harrogate developer at the centre of the Crescent Gardens controversy told the Harrogate Advertiser that, in his view, he is still under contract on the £75 million plans - even though the council announced on Monday it had ended the legal agreement with his company ATP (Crescent Gardens) Ltd.
Mr Thorpe told the Harrogate Advertiser on Tuesday how he was still negotiating: “As far as we are concerned we remain under contract on Crescent Gardens and our commitment with Harrogate Borough Council remains as such. We have exchanged on the building in good faith and acted accordingly. On Friday our planning consultant, ELG, submitted the bulk of planning documents at 4.05pm on the online portal. At 4.03pm our team emailed Helen Goulden at Harrogate Borough Council requesting the planning application fee amount. Our lawyer had earlier on Friday written to the council requesting a short extension until the end of this month for documents relating to elements which had material change. “These changes such as the removal of the restaurant and moving the access ramp in order to maintain the trees were both as a result of the feedback at the public consultation. “Through our lawyer, Michael McGarry, we have offered to supply the outstanding documents and planning fee along with a request for the council to stand by the contract. “Michael McGarry is continuing to liaise with the council and their lawyers in order that we progress to a mutually beneficial conclusion of the project for this important building. “We hope that common sense prevails and we can reach a satisfactory agreement with the council to avoid yet another lengthy sales and planning procedure for this scheme.